It is not a new idea, using flowers to enhance your home or as a centerpiece to a dining or party table. Flowers of any kind are beautiful and lively. And if the centerpiece features orchids, the orchids themselves can function as a wonderful conversation piece for you and your guests. An orchid display is a fantastic way to decorate a dining room or cocktail table for a fancy party or a simple get together of friends. Orchids are now so readily available in bloom from many of the local stores in the United States. And many of these now are available year round. They are not expensive and depending on the orchid, the blossoms can last for a long time. These days entertaining with orchids is a wonderful and gracious way to add to the festivities. I have been to many parties and folks seem to gather around the kitchen area and the living room / great room. I have noticed that at parties where there is a centerpiece people tend to gather at that spot. Why not use an orchid centerpiece? It is an easy, elegant and beautiful way to enhance the experience. You would be surprised how many people are interested in growing (or just admiring) orchids these days. 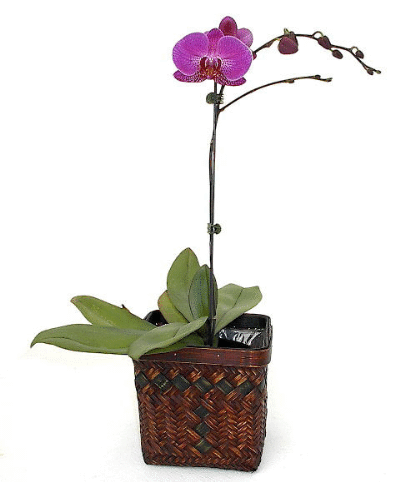 Orchids can provide such a wide variety of colors and shapes that they are bound to be a topic of conversation. Have you seen some beautiful orchids that are white with the dramatic purple lips or the yellow orchid with red to pin stripes? Or the majestic large white (often called Jumbo) Phalaenopsis? These plants usually have a tall, arching spike with large white flowers. These plants makes a statement all by themselves! Orchids allow you to do so much because of many varieties. Did you know there are at least 35,000 varieties so you can imagine the many color combinations? There is an orchid for every situation and every decor. Imagine a cocktail table set with orchids that are white with pink and red highlights. Add to that table three clear glass balls of varying shapes and maybe a candle or two. With little effort you have elegant party decor. And if you are growing the orchids yourself you have something to show off to your guests. Using orchids to as a centerpiece in your home when you entertain will allow the orchid to become a topic of conversation. And Why Not? Orchids are now the second most popular plant in the United States. I invite you to figure out more ways to have orchids share their beauty in your life. Entertaining with orchids is just one of those ways.